* WebRings Page To continue on your pilgrimage! The Webmaster neither endorses nor has control over any ad which appears on the above banner. and the original stain is not in you. You are the Advocate of sinners! Intercede for us with Our Lord Jesus Christ. 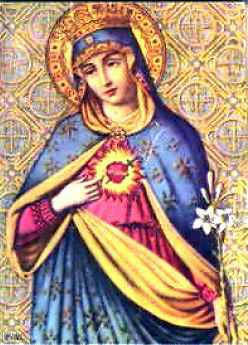 the Ever-Blessed and Immaculate Mother of our God. Who a virgin gave birth to God the Word. You, truly the Mother of God, we magnify! This page is dedicated to the all-holy Mother of God, Mary Immaculate, and to the dawning Marian Age: the New Springtime of Holy Mother Church. 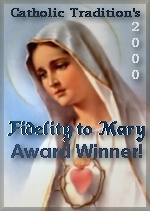 Do you object to this site, or to Marian devotion in general? If so, please visit this page. * The traditional Prayers of the Rosary in English and Latin. * The Face of Our Mother? So why not bookmark this page? I hope to be adding more soon, God willing!